Yule Love It Lavender Farm & Letters: What's a Fume Board? 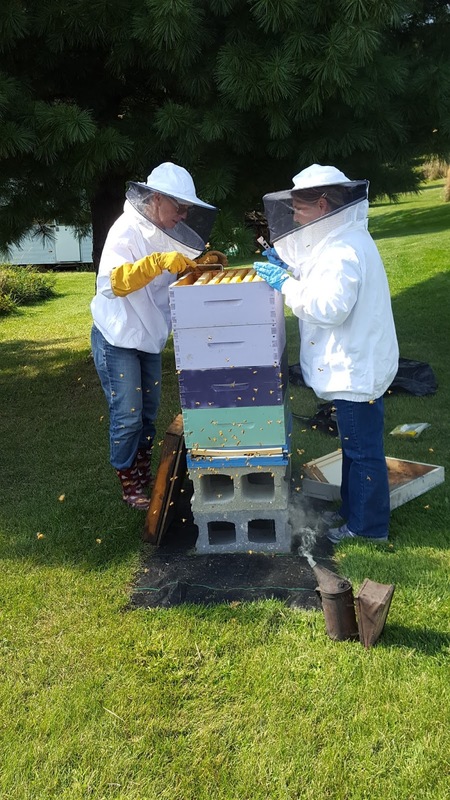 There’s never a dull moment in a beekeeping community. Peaceful? Yes. Boring? Never. Even in the midst of relaxing apiary observation, we stand watch for a robber bee, wasp, or spider web that attempts to snare a beloved pollen carrier. What bliss to assist in the production the most valuable food on this planet! Uh, oh, did I just say the S word? Indisputably, honey is pure. I won’t expound on raw honey’s endless benefits here, for my remarks and reflections are focused upon Mark’s fume board. I know; you non-beekeepers are puzzled. What on earth is a fume board? Who’s Mark? Please be patient. However, if you, dear Reader, are not familiar with the recreational, medicinal, and nutritional benefits of honey, I hereby recommend you do your research. But bee (Freudian slip), I mean, be prepared. Beekeeping can overcome our common sense. That’s assuming we own a smidgen in the first place. For the long-awaited season of drawing off honey is upon us. We apiarists, newbies to old-timers, are simply (there’s that word again) out of our minds. We’re drooling as we plan, prepare, and suit up for the big moment. Yes, when we stand beside our hive, for we NEVER stand before it. If we do, that means we need to read Beekeeping for Dummies. (And there’s nothing wrong with that.) We hold our hive tool up like a surgeon, pause, and take a deep breath with visions of capped honeycomb in our heads. Oh, one more thing. We fill our tank before we begin the sticky project of extracting honeyed frames from boxes. I promise the scent of raw honey will make am empty stomach grumble. Thus, our bee team of four consumed stuffed green peppers, slaw, melon, and blueberry pie yesterday afternoon to inaugurate our big event. Mary Ellen and I are somewhere between new and experienced beekeepers and know enough to prepare for surprises. They can be messy without well-fed bodies and informed minds. Our husbands led us down the hill to our apiary with camera and iPhone. I followed with Mark's fume board. Mary Ellen retrieved our bee clothes and equipment from the greenhouse and filled my grandfather’s smoker with dry pine needles. With all the pollen the bees carried into the hives, we hoped for a few frames of capped honey in the hive with four boxes. We aimed for that lid. I pulled Mark's fume board from its black bag. “I’ve never heard of a fume board,” Mary Ellen said. She held her favorite bee book and pointed to a picture of a bee escape. Well, dear Reader, Mark’s fume board turned out a mute point. Not one frame provided 95% capped honey. That means sealed and marketable. And who’s Mark? A generous neighbor of the experienced beekeeping kind who came to our rescue.